Hey Ya'll!! Today we start a new Faery Ink Facebook challenge!! The theme this month is Halloween or Fall. 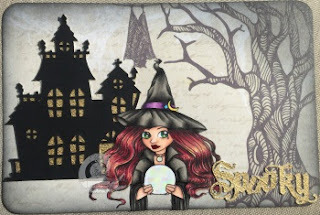 I chose to do a Halloween Pocket Scrapbooking card using Faery Inks Witchball!! I used some Recollections Ravenshead Manor papers to create this project and some CTMH Cricut cuts. As well as the Faery Ink Witchball image which I colored with copics. The gold paper is also a Recollections paper. 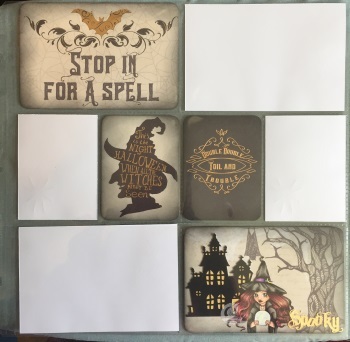 The Ravenshead Manor paper stack came with some pocket scrapbooking cards as well so it worked out so perfectly to create an entire matching layout!! I will add pictures to the empty pockets just as soon as Halloween is over!! I cannot wait to see what you all will create with this very broad theme this month!! Maybe you will enter your Faery Ink Swap flip book into the challenge before you send it off to your partner? If you haven't heard about our swap come on over to the Faery Ink Swaps Facebook Group to see what its all about!! Have fun creating your "spooky" projects this month!! !